I figured since many teachers’ schedules are affected by the end of Daylight Savings Time, now would be a good time to answer that question and provide some suggestions for decreasing stress related to our job. After reading this post, you will have a better idea of what mindfulness is and how it can benefit you. I’ll also share some actionable steps to start your own mindfulness practice and improve your morning, in-class, and post-class mindsets today! Let’s dive right into it. Before we talk about what mindfulness is used for, we have to talk a little about what it is and, perhaps more importantly, what it doesn’t have to look like. I’ll get into that last part in a minute. This is actually a pretty concise definition and one that’s useful for our purposes, as it touches on both the ‘awareness’ and ‘acceptance’ aspects of the practice. You focus on the moment-to-moment experiences while allowing any thoughts or feelings that arise to simply exist without judgment of or identification with them on your part. In other words, you don’t allow these thoughts or feelings to dictate a story about you and your day that is inherently positive or negative. They simply exist, they just ‘are’. 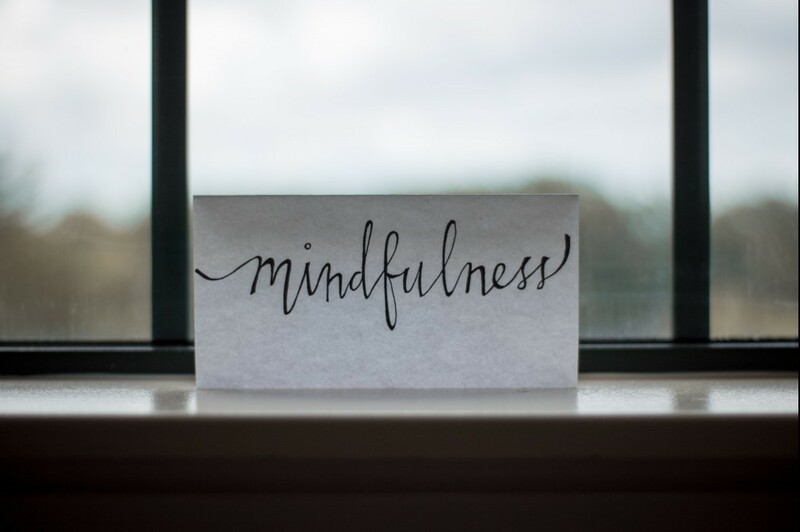 Mindfulness in its contemporary form has been used in behavioral and stress-reduction therapies, and it has found its way into locations ranging from schools and corporations to prisons and law enforcement agencies. Its roots, however, are often traced to the foundational elements of Buddhism, and here’s where it turns some people off. They feel that those activities belong solely to a specific practice like Buddhism, or that they’re too ‘woo-woo’ to be taken as practical methods for dealing with stress, depression, etc. I know that this was why I took so long to give it a shot! But we don’t have to implement the kind of daily mindfulness we’re talking about as an esoteric practice, used only by members of a specific faith. Anyone can use it, and this includes online teachers of course! With differences in time zones requiring inconvenient scheduling, the lengthy periods of remaining attentive and in ‘go-mode’ for your students, and the strain of sitting and staring at a computer screen, who wouldn’t be looking for something to make life a little easier? Jason, we already have the answer: consume countless cups of coffee. I love my morning cup of joe as much as the next person, believe me! And don’t worry: our favorite bean-based brain booster will have a featured role in the next section. But you don’t need added restlessness and increased irritability when you’re trying to have patience with learners, right? You don’t want to have more trouble getting restful sleep when the day is done, either. 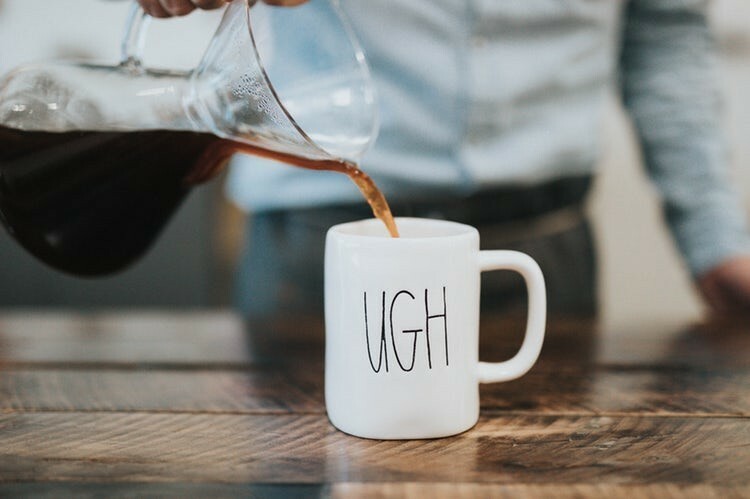 So, let’s cut back on the caffeine and look at the top 3 benefits for online teachers of implementing a mindfulness practice. You’ll be gaining the equivalent of superpowers for online educators. Experiencing these benefits has helped get me through some difficult weeks, so let me walk you through my mindfulness practice now. The way I implement a mindfulness practice is pretty straightforward and simple. I’m sure many people would argue it isn’t even a dedicated practice, but it’s what works for me! Remember that everyone is different, so take what you like, make it your own, and leave the rest! I set my alarm to wake up a few minutes earlier than necessary so that I can listen to the morning sounds for a few minutes while breathing deeply. Using a technique my brother taught me, I try to listen for the softest audible sound that isn’t made by humans. Breathing with your diaphragm (think expanding outward not upward) enhances the exchange of oxygen and CO2 while doing so. To practice this, place a book on your stomach while lying down. As you breathe in and out, the book should rise and fall. Next, I set my coffee. Here in the US, this is a faster process, as I use a Keurig machine-but in Spain, it was much slower with a Moka pot. I love paying attention to the smell of the coffee brewing, listening to the water boil. Your mind will wander, and many thoughts will come and go-acknowledge them and return to the present sensations. I have a bit of fun and make it a game to find and turn off all Wi-Fi devices in the house, then I reset my laptop and clear my browser cache to prepare for classes (we give 5 tips to prevent teacher IT problems in our post on How to Fix Internet Problems). I do it deliberately, and I don’t do other tasks like check email or social media. I have to teach soon, so looking at those will only pull my attention away from the tasks at hand. I try to listen intently to the student, focusing my awareness on the current material and student in front of me. If feelings of overwhelm arise, acknowledge, and accept them, but don’t react to them. Breathe deeply and lean into them, and use them ask guides to help you figure out where you can improve later on. For example, if you’re stressed during a lesson because you don’t know how to teach a specific topic, take some time before your next class to look over the material and Google facts you’re unsure of, or ask for advice in the comments! 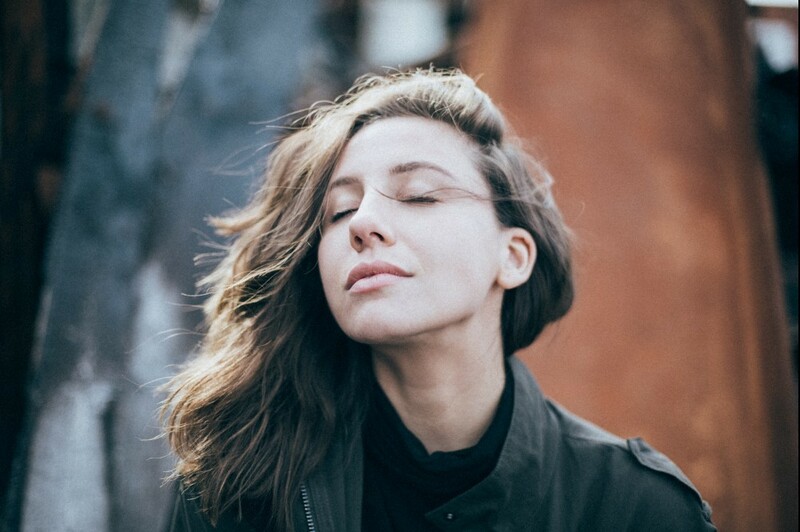 Between classes, more deep breaths, focusing on the sensations of each one, and acknowledge if your mind wanders with a word like “thinking” or “wandering”. Stretch a bit, and reset the space for next class. In Spain, I had a small apartment, so all items had to be returned to their storage spots and desks and chairs put back into place. Breathe deeply (notice a pattern? ), and focus on the process of resetting your space. If you receive a bad review, use your feelings of frustration as a guide: you likely feel this way because you care! Don’t take it personally, as there are different reasons why this may have occurred (lost in translation, they were having a bad day, out of spite for your honest and accurate assessment), but try to learn from it. Can you speak slower and clearer, can you present the material better visually? Sometimes you’ll still receive less than perfect feedback, but you can’t please everyone! Despite the potential stressors like lesson planning, tech issues, or difficult students, it’s best to learn to embrace the potential chaos of teaching online. At the end of the day, we have a job that allows us to work wherever we want and, often, whenever we want. We get to ‘travel’ each day to a different country and participate in an exchange of culture that broadens our perspectives of the world we live in. Just remember to breathe deeply, focus your attention fully on the present, and enjoy the process of your teaching routine! As an author without kids, I’m lacking a parent’s perspective! Do you have any routines or practices you implement to help you reduce stress and get through the week, especially as a parent? I’d love to hear about them in the comments! 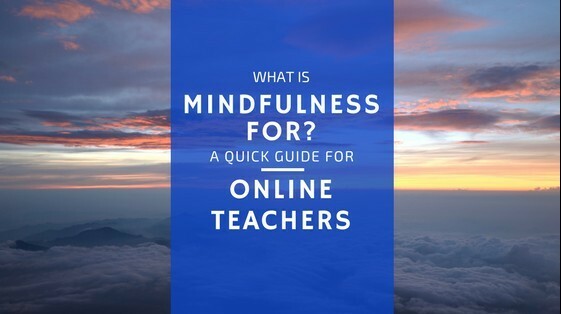 This entry was posted in How to Teach Online and tagged focus, mindfulness, routine. Bookmark the permalink. I often thought of becoming a teacher. I never thought of turning to online media as a platform. You just gave me an idea! On mindfulness, I fully agree. It’s another way of saying live in the present, enjoy it, and let life flow. The energy and positive attitude will come as if my magic. When was younger, I thought about the future a lot, but life never exactly worked out the way I planned. As I grew older, I started to look at the past and reminisce, but that also left me drained of energy. Today I practice mindfulness in what I do. That’s awesome Zaid! Let me know if you have any questions about teaching online! Jason, teaching is a noble profession. It is something I aspire to do one day. I remember the teachers that changed my life, not the bosses I met along the way. I wish I could go back and thank them. The only way I know how is to leave my mark on this world by giving that gift to someone else. I envy you if you can do it already! I appreciate the genuine comments Zaid! – I’ve always thought along the same lines when it came to teaching. Just remember that even if you’re current job title isn’t something in the education field, everyone still has something that they can share with and teach to others! You’re no exception of course, as I’ve learned a lot of useful information just from checking out your site. If you do have any interest in teaching online, feel free to sign up as a member so you get our weekly updates and can post questions to other members in the Community Discussions. Also, check out our blog, and take a look at http://www.teacherindie.com. This was one I’ve used as a guide since it was started. Thanks again Zaid-it’s good to hear from you! What a fantastic article, it is great to see mindfulness becoming more excepted in main stream life. I have studied religious philosophy for years and you are right in saying that the religious overtones of meditation does turn a lot of people away from practicing. It is a shame that it does because mindfulness in my mind is only the first step of many into a wonderful world which is waiting to be experienced. Hopefully your article will help guide people to taking the first step. And then the rest is destiny. I agree with you: it certainly does open a door to many other wonderful (and practical) disciplines and experiences :). I love trying to help people realize just how useful these practices are for everyday applications, daily well-being, and activities you might never think to apply them to (like I noticed your site does with golfing!). Thanks for reading!